This stylish window curtain panel features a stripe pattern and blackout design to add elegance and function to any room. Transform any room in your home with the Eclipse Nikki blackout curtain. Independently tested, Eclipse offers a superior blend of window fashion design and blackout technology for any decor. Update the bedroom, living room or dining room and enjoy the light blocking, noise reducing, energy-saving benefits of Eclipse. Perfect for daytime sleepers of all ages, home theater enthusiasts and energy saving conscious home owners, Eclipse curtains offer style versatility for any living space. The magic is in the Thermaback construction. 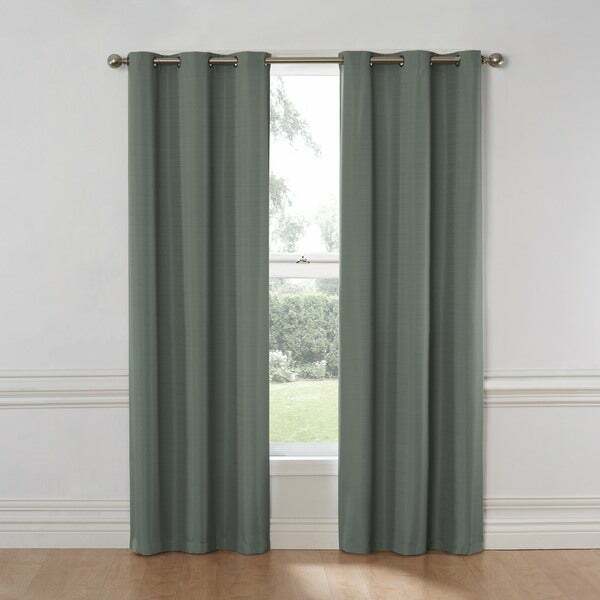 The innovative foam-backing is applied to the fabric and allows you to enjoy all of the light-blocking, noise reducing and energy saving benefits, while providing the same fashionable style and elegance of naturally flowing curtains. Hang eclipse curtains in any bedroom to achieve an optimal sleeping environment. Each Nikki grommet panel measures 40 inches wide in your choice of 63, 84 or 95 inches long. 1.65 inch antique bronze grommets fit up to a 1.5 inch rod. Tone on tone textured weave offers a subtle horizontal stripe. Available in, chocolate, mushroom, river blue, smoke and spice. Curtain rod sold separately. Sold as single panel. 100-percent Polyester. Machine wash gentle cycle, tumble dry, do not bleach. Imported. The color and texture of the fabric was very lovely. I bought Spice color and it was a nice warm reddish-brown. They blocked the light wonderfully. Ultimately I returned the curtains because I found a color that matched the room better from a different manufacture. Those curtains didn't block the light nearly as well though. The Nikki curtains were quite creased (as all folded materials are) but they sent instructions on how to remove them which is certainly helpful. Excellently made blackout curtain with beautiful color and style. Made my rooms look so sophisticated! Very well priced as compared to other stores and top notch quality. I am very pleased with my Overstock.com purchase! I purchased for our spare bedroom. They are nice curtains and block the sun as promised. These are great curtains, work well to block out light. They are attractive and not real heavy. Quality curtains. I was concerned that the thermal lining would be a sticky, thick spray on adhesive backing that would peel! Instead it a uniform , white integrated lining. True black out curtains. Love the quality and the feel and elegant look we received with this purchase, it has transformed and elevated the space! You will not be disappointed! These hang very nice and the color is beautiful. "Is the fourth image considered the Mushroom color?" We apologize for the confusion. The colors in order from left to right are River Blue, Smoke, Mushroom, Chocolate, and Spice. "is this one panel per package or a pair"
One panel is included with each order. "would smoke be considered grey?" The smoke could be considered grey. The second image is the grey option.